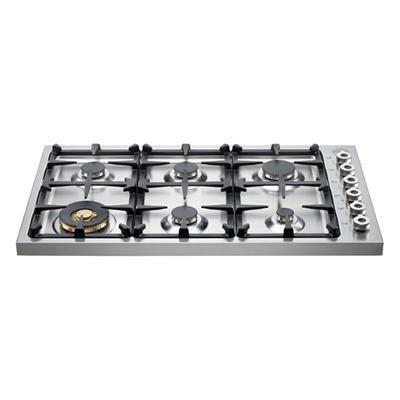 Bertazzoni Professional Series 36" gas drop-in cooktop with 6-brass burners. Bertazzoni gas cooktop has the same one-piece, seamless, high-efficiency worktop design that has become the signature of the brand freestanding ranges. 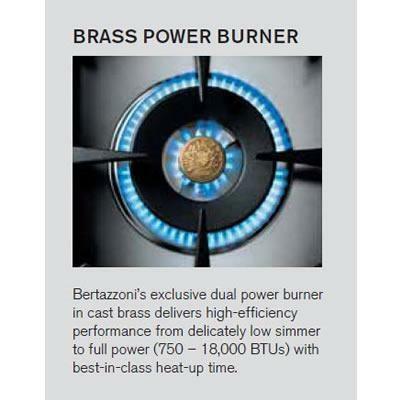 All burners are in cast brass for enhanced performance, with the dual control brass power burner delivering best-in-class heat-up times and maximum flexibility thanks to its BTU range. Power Output Semi-rapid: (3) 6200 Btu/h; Rapid: (1) 11000 Btu/h; Dual Wok: (1) 750 Btu/h - 18000 Btu/h; Auxiliary: (1) 750 Btu/h - 3400 Btu/h. 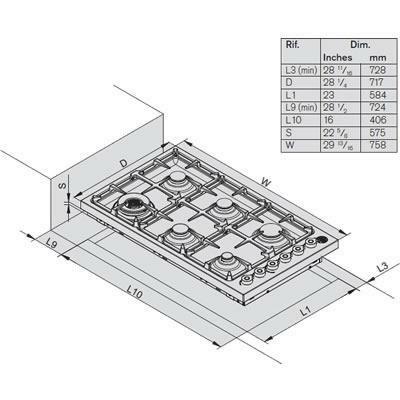 Additional Dimensions Cut-out height: 1 3/8 in; Cut-out depth: 20 15/32 in; Cut-out width: 35 5/8 in.